Yes, there are many things going on this weekend in central Ohio. “Lots!” For the first time there is a link to the ’365 Things to do in Columbus, Ohio’ Facebook page here on ColumbusBestBlog.com* in the sidebar. Here’s a thing happening in September, in the Lewis Center, Ohio area that is part of a larger thing happening across America, the Conquer Chiari Walk Across America 2012. Saturday, September 22nd, 2012. Registration begins at 9:00 AM. Walk begins at 10:30 AM. Too late on those T shirts huh? I should have posted this immediately when Beth posted it on ’365 Things to do in Columbus Ohio’ on Facebook. Beth provided me info about what Chiari is. I had never heard of the condition. I will post about this again. 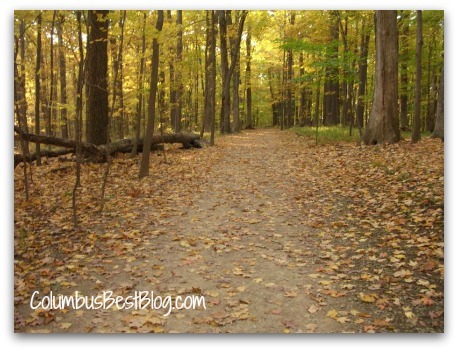 The photo is a trail at High Banks Metro Park a few years ago. Leaves will not have changed yet, on September 22, 2012 will they? The trees in Highbanks Metro Park will still be all green won’t they? We’ll still be having summer…. or will we? Next post: Columbus Home Prices Rise to 2007 Level!